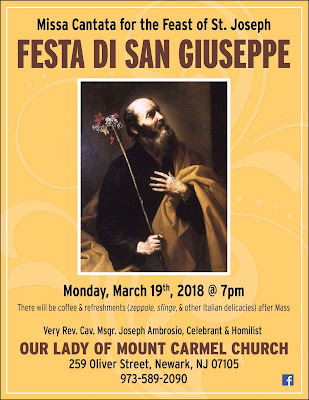 There will be a Traditional Latin High Mass sung for the Feast of St. Joseph, on Monday, March 19th at 7:00 p.m, at Our Lady of Mount Carmel Church in Newark, New Jersey. Following the Mass, there will be light Italian refreshments including zeppole and sfinge to celebrate thename day of pastor, Msgr. Joseph Ambrosio. The church is located at 259 Oliver Street.